There's a number of fine Cheap Trick related sites on the WWW. 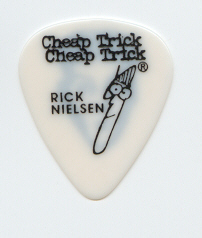 First and foremost, visit the band's official site at http://www.cheaptrick.com. This contains news, and a whole host of other goodies including a fans Bulletin Board. A number of other excellent sites have been developed by fan's around the world (USA, Europe, Japan, Australia, Uruguay), containing photo's, discographies, audio, and loads of other great stuff. I highly recommend you check out the CHEAP TRICK WEB RING at the link at the bottom of the "Welcome" page (underneath the hit counter), and then go and explore ! The often lively, interesting (and unregulated) newsgroup at ALT.MUSIC.CHEAP-TRICK continues, though far fewer people post there than in its heydey between around 1998 and 2002. But do drop in, post your views, read the wit, and join some fan's in discussing various Trick (and often non-Trick) related topics. And finally, some links that have a slight connection with Cheap Trick, or maybe nothing to do with Cheap Trick, but are links to stuff I like a lot. Feel free to follow and see if anything takes your fancy ! Roy Wood (the legendary British musician, and an influence on Cheap Trick) - http://www.roywood.co.uk. If you live in, or are visiting the UK, check out Roy's touring itinery at this site. Check out upcoming Tennessee rockers The Shazam on their website at http://www.theshazam.com. They got plenty of great press in the UK during 2000, and their CD releases to date are all excellent and worth buying! A pleasure to meet and see them in the UK in Sept 00. And they love Cheap Trick too! Siamese cats - http://www.meezer.com - (there's a picture of my 3 "little girls" in the "Other" section of Photo Gallery 1). Bristol City Football club - http://www.bcfc.co.uk - Come on your Reds!